Sassier than Susie Dent, quirkier than QI, more devilish than Dan Snow. Word of the Week is a gallant foray into the labyrinthine passages of the English language. On the face of it, it’s a column about words, but read beyond the first word and you’ll discover a thrilling assemblage of etymology, trivia, nostalgia, anecdote and historical stuff. Featuring words like Random, Derrick, Pants, Trump and So, Word of the Week is unlike any other study of the English language ever published. In a good way. Never miss an episode of this insightful and amusing exploration of the words we use today by subscribing to the regular Friday emails here. 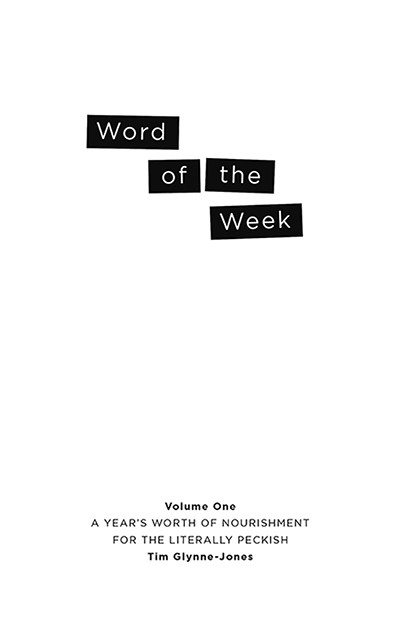 Impress your friends by leaving a copy of Word of the Week: Volume One on your coffee table or in your loo. Better still, give them a copy for Christmas.